When your mom is 91 and going blind, and is still living alone in her house, there is constant concern about her welfare. Mom is still very sharp, but due to advancing blindness, she couldn’t recognize faces and was prone to open the door to strangers thinking they may be a relative, friend or neighbor. 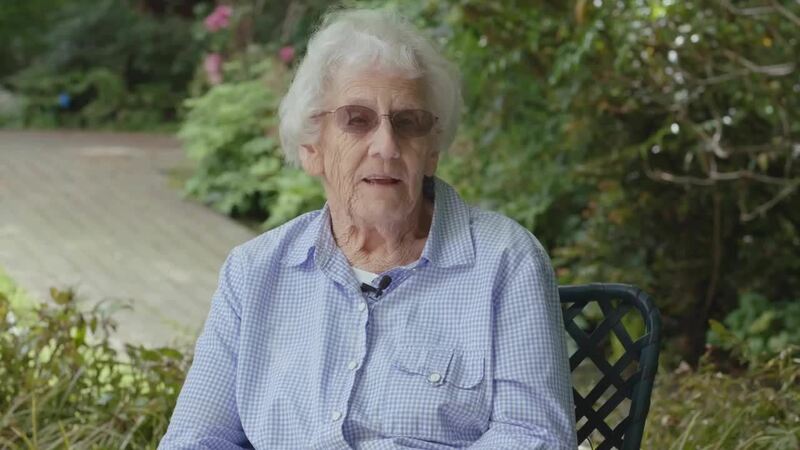 Among other safety issues, she struggled to accurately dial a phone number, her balance wasn’t good, she couldn’t see her prescription bottles or find a pill if it dropped on the floor, and her laundry room was in the basement, and she had been injured twice from falling down those stairs. If Mom didn’t answer the phone at one of our regularly scheduled calling times, it was instant worry, resolved only by getting in the car to drive to her house to see what was wrong. 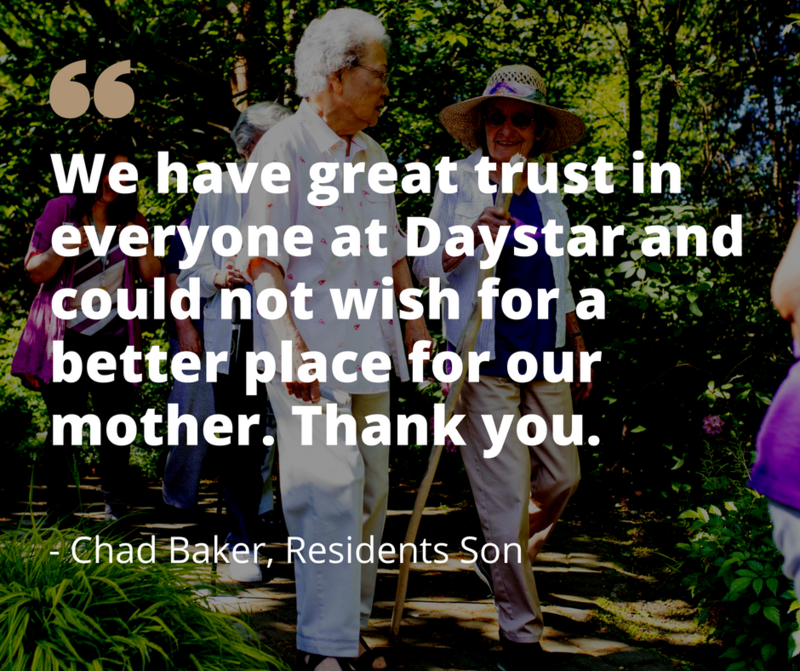 Now that she is at Daystar, if she doesn’t answer the phone, there is no more worry – there is always caring staff around to check on her, and it’s likely she didn’t answer the phone because she was playing bingo in the Garden Building Lobby! Daystar means a rest from grocery shopping, cooking, cleaning & laundry! It was clear by the blackened pot on the stove that cooking wasn’t going too well. Rather than skipping meals because it was becoming too difficult to prepare them, Mom now has 3 complete meals a day available in the Daystar dining room. In addition, Daystar staff does her laundry, makes her bed, takes the garbage out, and cleans her apartment. Daystar means less bill paying, record-keeping, and no more responsibility for home repairs! Mom could no longer read her mail, could not write checks, could not file her paperwork, and could not make phone calls to deal with errors or questions regarding bills. At Daystar, heat, electricity, cable, garbage are all included in the rent, so there is less paperwork for mom’s daughter to take care of. Mom was struggling to maintain her aging house and was upset by the constant repair issues that would pop up – furnace malfunctions, hot water tank replacements, sewer back-ups. She was even unable to see well enough to change a light bulb. Now she contacts Daystar maintenance. Even the TV was a problem – when you can’t see, it’s easy to disable the TV by pushing the wrong buttons on the remote control. Now there is always someone around to help. I want to let you know about an exceptional employee here - Vanessa. She is always so helpful, friendly, concerned, compentent and a wonderful caregiver! She is truly an asset to Daystar - I just love her! I always feel reassured that whatever comes up, she'll be able to handle everything. At Daystar – we’re treated like old friends! Mom is very happy with her new apartment and the services she is receiving. Thank you all for helping us in this transition. The staff is very caring and responds quickly and efficiently. The thing I like most about living here is the many pleasant and smiling faces that I love! I hope you know how much Dad appreciated the excellent care he received from you! Wow! What a lovely place! It's so homey and you can tell people are loved and cared for here. Please express to the staff how appreciative my mother is of all the staff, and the help they provide to her. She wouldn't get along nearly as well without the caring and concern of the Daystar employees! Hey, this is a nice place! It's so clean! My dad is starting to get forgetful. It would be great if he could live here. She has received such kindness and so much attention from everyone that we know without a doubt that she is safe and well cared for. We have great trust in everyone at Daystar and could not wish for a better place for our mother. Thank you and thank you to all concerned.